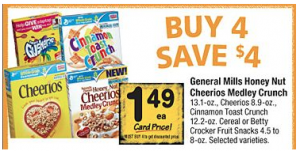 Stock up deals on cereal and granola bars at Safeway stores! 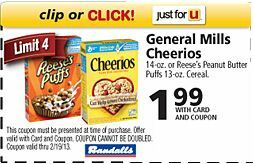 If you have a Safeway or Safeway affiliate store (in my area, it’s Randalls) in your area, you can score STOCK UP deals this week on cereal and granola bars, especially if your stores double coupons! Final Price = $.99 per box after coupon IF your stores double coupons! Final Price = $.99 per box after coupon IF your store doubles coupons! NOTE: In my area, Randalls will double one “like” coupon per transaction with a face value up to $.50. Check with your local store to find out what their policy is. Pricing may also vary by location. Check your ad for details and exact pricing. Betty Crocker Fruit Snacks just $.49 per box plus cereal deals! If you’ve guy a Safeway affiliate store in your area (it’s Randalls in my area), make sure you check out their Buy 4, Save $4 sale! 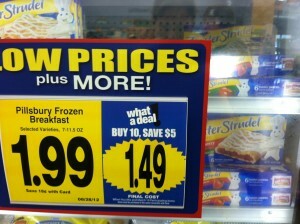 You can score STOCK up deals on Betty Crocker fruit snacks and cereal! The Fruit Snacks will be just $.49 per box and you can get Honey Nut Cheerios for just $.89 per box! Final Price = $3.16 for everything! My Weekend Shopping List: Cheap Cereal, Capri Sun, Thanksgiving items and more! There are so many good deals today and I’ve been busy making my shopping list! I’ve got trips to Kroger and Randall’s (which is a Safeway affiliate store) planned and I’ve been using all of my computers to print coupons! NOTE: If your stores double, they will be $.25 each when you buy 2! What’s on YOUR shopping list today? If you have a Safeway or a Safeway affiliate store in your area (Tom Thumb, Randalls, Von’, Genuardi’s, Dominick’s, Pavilions, or Carrs), you can get super cheap Betty Crock fruit snacks this week if your stores double coupons! They will be just $.49 per box after coupons! Click on the links below to print your coupons: you should be able to print each coupon twice! NOTE: You must buy in multiples of 4 to take advantage of this sale pricing. Check with your store to find out about their policy for doubling coupons. At my Randall’s stores, you can only double one “like” coupon per transaction. Since these are two different coupons, I should be able to use both of them. My kids love Pillsbury Toaster Strudels, and so yes, I’m one of “those” moms that actually buys stuff like that for my kids every now and then. 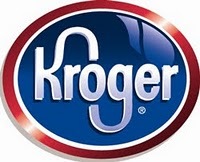 Right now, you can actual make $1.28 after coupons and rebate if you have a Kroger store in your area! The Pillsbury Toaster Strudels are part of the Mega Sale at Kroger this week: buy 10 participating items, save $5 instantly! Final Price = $1.28 moneymaker after coupon and rebate!